Now Available through McFarland and on Amazon. I am pleased to announce that my new book on the history of the United States Football League is now available for immediate shipping. 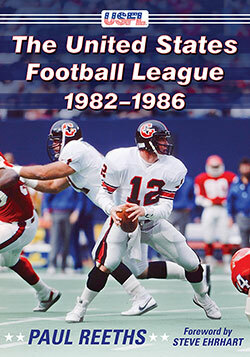 With a foreword by former league official Steve Ehrhart, the book tells the story of the USFL in the words of the players, coaches, owners and administrators who made the league so much fun. "One of the most ambitious (and short-lived) endeavors in professional sports history, the United States Football League was founded in 1982. Premiering with a spring schedule and an abundance of talent that included top rookies and National Football League veterans, the USFL gained national attention with broadcast and cable television contracts, controversial player signings, ownership battles and an unsuccessful billion-dollar lawsuit against the NFL. The USFL folded after four years yet represented the last major challenge to America’s big four sports leagues—the NFL, National Basketball Association, National Hockey League and Major League Baseball. Based upon extensive research and interviews with owners, coaches, players and administrators, this book chronicles the league’s formation, its three seasons of play and its long-term effects on pro sports." Please follow the book page on Facebook for more information. Welcome to the online home of the United States Football League. 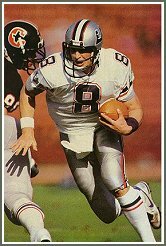 The ultimate league from the 1980s, the USFL provided fans across the country with professional football in the spring and summer. Three consecutive Heisman Trophy winners played in the league as well as future NFL and CFL MVPs and all-stars. For three seasons, the league played some fun and entertaining football at a time of the year previously devoid of the game. The USFL maintained its share of attention off the field, as well. Controversial owners including Donald Trump, player signings, a contentious debate over the merits of moving to the fall and a one-billion dollar antitrust suit against the NFL kept the league in the nation's headlines like no other major league competitor before it. This site is dedicated to everyone who made the league so much fun: the players, the coaches, the owners (even Donald Trump) and you, the fans. But most of all, this page is dedicated to John Bassett, the late owner of the Tampa Bay Bandits who believed that spring football could succeed. It is my hope that this site will preserve the memory of a great league and help keep the USFL's place in pro football history alive. On this site you can check out some of the most exciting players in the league, coaches, teams and even team uniforms. To find out more about the league, read the USFL's history, including standings and game results and a recap of their antitrust suit against the NFL. You can also view videos of some of your favorite players in the USFL multimedia archive. The Collectors' Corner features several USFL collections. For site credits, see who made the USFL site possible. Join the Yahoo! Group today to talk with other fans about the USFL.